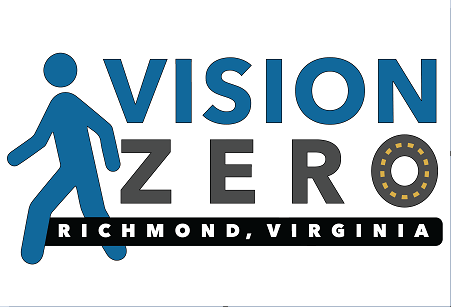 On October 27, 2017, Mayor Levar M. Stoney signed a pledge to wholeheartedly commit the City of Richmond to Vision Zero and eliminate all traffic‐related fatalities and serious injuries on city streets by 2030. This is a big vision and the right vision for us to act on. Because traffic crashes are preventable, no deaths or injuries are acceptable. Unfortunately, Richmond has seen a steady increase in traffic fatalities over the past couple of years. So far in 2017,traffic crashes have claimed 21 victims in the City of Richmond ‐ the highest amount in years. This is unacceptable and you can help make a difference. Acting upon the pledge, the Safe and Healthy Streets Commission is creating a Vision Zero Action Plan. This multi-stakeholder safety plan will provide a strategic framework to eliminate highway fatalities and serious injuries on city streets. Input from the community (you!) and involved stakeholders is a vital aspect of making Vision Zero a success. The Commission through its consultant, VHB, is seeking additional input as an opportunity for you to express your existing safety priorities and concerns as well as develop actions that involved stakeholders may work together on to get to zero. Developing a better transportation safety culture is our primary goal. Thanks for all that you do to improve our safety record. * 1. Is Transportation Safety an important part of the culture of your organization or agency or family? Does your organization include transportation safety in it’s mission or strategic plan or similar? Does your agency have a safety target? * 2. How do we shift our transportation safety culture in our families, schools, places of worship, and at work? * 3. What is the best way for our safety stakeholders to communicate? What are our current barriers to effective communication, coordination, and cooperation? * 4. Who are our transportation safety champions? What are our existing roles to improve transportation safety? Based upon our commitment to safety, are there new critical roles to achieve our vision? What are the gaps and how might new or leveraged resources improve safety? * 5. How do we sustain our efforts to save lives and prevent serious injuries from motor vehicle crashes on our city streets? Are we willing to commit? * 6. What actions can we take to address transportation safety? What actions could the mayor take through executive action? What actions could City Council take through policy and budget? What actions could we all take to change our transportation safety culture?